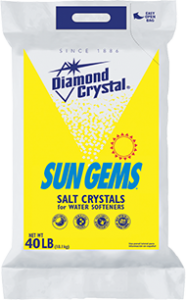 An extra coarse, white solar salt product made by solar evaporation of seawater. Sun Gems contain no anti-caking or free-flowing additives or conditioners. Available in 40 lb bags (63 per pallet) and 50 lb bags (49 per pallet).